If you have any comments, complimentary or otherwise, or questions, We would love to hear from you. Contact us here. "Just to say a huge thank you for our sofa cushions which arrived today.We are so pleased with the result - the sofa looks like new and feels amazing too!Thank you once again, we will plan to get our second sofa done once we've saved up!." "I know I keep repeating myself every year, but I cannot thank you enough for all the help you keep giving me by supplying foam. If it wasn't for you I wouldn't be able to make all the door drops to people asking for their support for the East Anglian Air Ambulance. Thank you." "I want to thank you for your careful attention to my 3 orange cushions before Christmas. From my first enquiring phone call to delivery to my son was first class service. I haven't actually seen the cushions as yet but my son is using words like; 'Fabulous', 'Fantastic' and 'Beyond our wildest dreams', so I guess he's pretty pleased!! I won't hesitate to use you again and have already recommended you to others! " 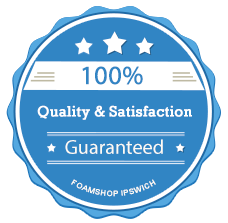 "The Foam Shop; Delighted with the cushion seats, they fit perfectly and look great. Many Thanks "